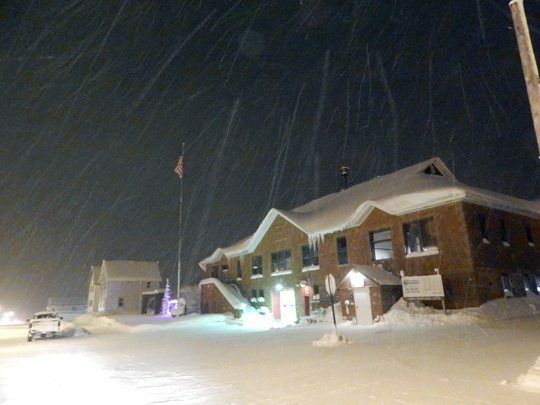 Kali Katerberg/Daily Mining Gazette Snow flies at the South Range community building where the Village Council meets each month. SOUTH RANGE — The Common Council of the Village of South Range has been working for more community involvement and improvement, goals that continue into the new year. Towards the end of 2017, the council sent a letter updating residents and committing to better community reach and improvement. “We want to help keep everyone informed on what’s going on in our great town, and encourage everyone to get involved,” Village President Justin Marier said in the letter. In 2017, the council improved the village website, worked to improve the budget, and moved to do more with enforcing village ordinances. Projects going into 2018 include the upgrade to the playground between Sixth and Seventh streets and action on dilapidated buildings around the village. More plans are in the works to be discussed later this year. The council would like to hear from their constituents, sending out a survey for suggestions on future direction and requesting feedback.